Preheat oven to 360˚ F.
In a medium bowl, combine ricotta cheese, quark or farmer cheese, sugar, grated citrus peels and vanilla extract, and mix until smooth. Add eggs and mix to combine. Mix melted butter with vegetable or canola oil and ground cinnamon.Brush a 13-by-9-inch baking dish with a bit of melted butter, Set aside. Place phyllo sheet stack on work surface, cover with damp kitchen towel. Layer 7 sheets of phyllo and brush gently each layer with melted butter. Put the phyllo stack in prepared pan, with excess dough overhanging the edges. Scatter date paste over the bottom, and pour over the sweet cheese filling. Repeat stacking and buttering 7 more phyllo sheets. Using a sharp knife, cut through the top of the phyllo stack into diamonds shape, leaving the bottom side still attached. Move the stack carefully and put it in over the cheese filling. Trim the excess dough with sharp scissors. Bake the baklava for 45 minutes, until puffed and golden-brown color. Transfer pan to a wire rack. In a Small saucepan, combine sugar, water and fresh lemon juice, and bring to a boil. Reduce heat and let simmer until sugar dissolves and mixture is syrupy, about 10-15 minutes. Mix in orange blossom water. 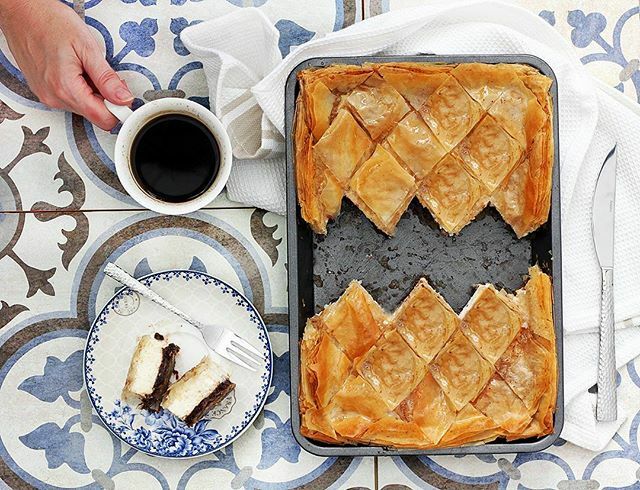 Pour the hot syrup gradually over the warm baklava. Cool to room temperature, and serve immediately.